Carpet has some many benefits, from comfort underfoot to warmth in a room to adding color to a space. At ProSource® of Hampton Roads, you’ll find a wide assortment of choices for any home remodel at a budget-friendly price. From traditional looks to modern styles, there’s a carpet to match any design and preference. Select from nylon, olefin, polyester, or wool. Today’s carpet is more durable, as technology enables it to perform better and last longer than ever. Plus, advancements in protection help win the battle against spills and stains. Discover what carpet can do for your renovation project. Designer-inspired, pre-made area rugs are nice, but are limited by their size and style. Actually, any carpet can be cut and bound into a custom area rug. The realm of possibilities expands, allowing the desired style or color to be chosen and the needed size to be created. Reimagine the preferred look of a space by selecting any carpet and fashioning a custom area rug. This type of loop carpet is constructed with thick yarns having randomly-spaced flecks of color against a background of a base color. The term “berber” was originated in North Africa by the Berber tribes. 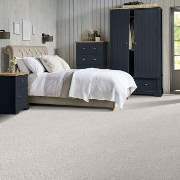 It’s a versatile style of carpet that’s fairly durable, and the nubby weave it displays helps conceals dirt and vacuum marks. That makes it a good choice for heavy traffic areas. This carpet carries a fancy name but tends to have an informal look. Nevertheless, it packs a comfort to its feel. 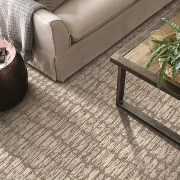 Frieze is a shag-style carpet that features long, tightly twisted fibers. This forms a “curly” textured surface. That helps minimize footprints and vacuum marks, making frieze a great carpet for high traffic rooms. 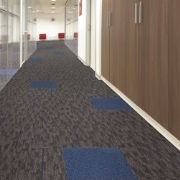 For this carpet, loops are the same height, which creates a uniform look. Another option is a multi-level loop, which usually has two to three different loop heights to create pattern effects, while providing good durability and a more casual look. Then there’s cut-loop (or cut and loop) pile, which combines cut and looped yarns to provide a variety of surface textures, including sculptured effects of squares, chevrons, and swirls. Sometimes called velvet or velour carpet, plush is known for its luxurious touch and comfortable texture. It can be distinguished by its smooth and dense weave. The carpet pile is short and slightly twisted. Because it tends to display tracking from footprints and vacuuming, plush carpet is better suited for less trafficked rooms. Texture carpet tends to have uneven fiber lengths, giving it a a fuller, more textured surface. This can provide the flooring with a touch of character. Its popularity stems from the way it’s made. 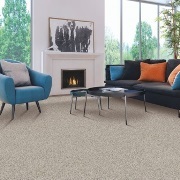 The cut pile process combined with uneven and/or twisted fibers makes texture carpet durable and less likely to show dirt, tracks or dents. When there’s a desire to break from a solid look, have a patterned carpet make an appearance. The pattern can be tone-on-tone, which adds a subtle yet distinct look to the flooring, or the carpet can have a complex pattern that may include different colors or designs. The flooring takes on its own personality. There are numerous possibilities, from stately views to eclectic styles, that can dress up any space. When one color is preferred for a space, large or small, select a solid carpet in the color of choice. But a single color can present multiple options, from light to dark and all manner of shades in between. The color wheel includes brown, blue, red, green — just about any hue that can be found. It can add a pop underfoot or subtly blend with a room’s décor. 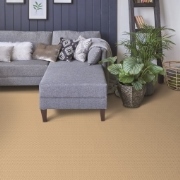 Whatever the desired look, solid carpet is a solid choice. Through the H2O waterproof floor technology, liquid stays where it can be seen and dealt with. 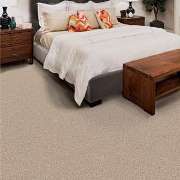 These revolutionary carpet products have a special backing with a moisture barrier. It keeps all liquids — not just water — above the backing, preventing moisture from soaking through to the floor underneath. The desired design doesn’t have to be limited, as these carpets are available in several colors and styles. 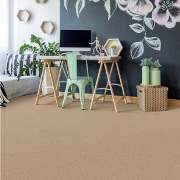 A comfortable carpet which provides a cushion-like feel is desirable for young ones, especially those prone to tumbling over. Kid friendly flooring, though, needs a bigger reach to meet the demands presented by tikes, toddlers and teens. It should hold up to spills, stains and high traffic. Luckily, today’s technology enables that. Look for carpet that offers protection for all that life, especially kids, may thrust upon it. Furry friends use the floor to wander the home, take a nap, and sometimes get into mischief. Carpet needs to withstand the perils of pets. Advancements have empowered carpet to fend off the worries animal life inside the home. 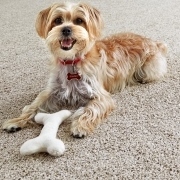 Stain protection, odor resistance, and many other defenses can be found in a variety of carpet options, ensuring the flooring is pet friendly. Carpet isn’t just for the home; it’s for the office as well. The demands in a business environment are different than residential, as traffic is heavier, and equipment and furniture pose weight challenges. The flooring needs to be durable so it can perform for the long haul. It should also be stylish. After all, it makes an impression on visitors. For small offices to large business buildings, commercial carpet can work.